GitBook now displays beautiful status indicators on your GitHub Pull-Requests. 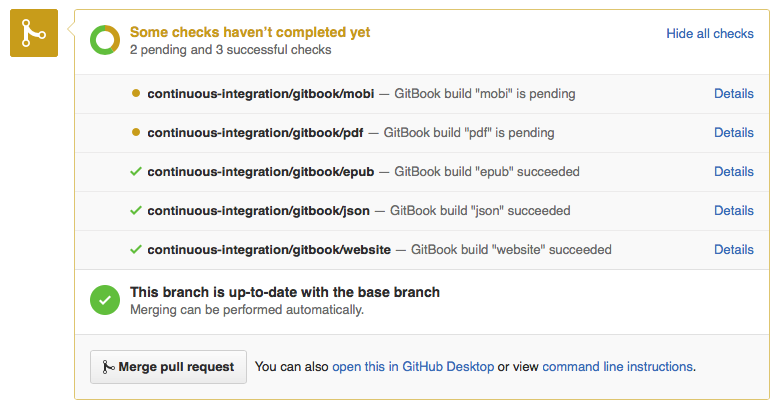 Starting today, GitBook updates the build status on your GitHub pull requests. Once you open a PR, we update it’s status as the build progresses. When the build passes or fails you’ll get a small link back to our build details. Overall this a small but useful feature, making it easier than ever to merge a pull request without having to worry about breaking changes.